Many people, intending to change the flooring, stop at the laminate flooring - it is not very expensive, and looks no worse than parquet, and has been serving for many years. But there is one important point - you must choose a laminate, the characteristics of which correspond to the conditions of use. Just about the technical characteristics of the laminate and will be discussed in this material. This flooring can often be very similar to parquet, solid wooden plank, ceramic tiles. Some manufacturers produce laminate "under the skin", "under the stone", "under the metal." In time, probably more interesting varieties will appear. There is an erroneous opinion that the floor of an inexpensive laminate is significantly inferior to the parquet floor in all quality parameters. But the opinion is wrong. After all, the creators of the laminated coating just wanted to save him from some of the shortcomings that are inherent in the parquet. By the way, they did it well, only the HPL technology used at the beginning turned out to be expensive. Therefore, at first, prices for laminate were high - only at the end of the last century, thanks to the advent of DPL technology, its production became more budgetary. 1. The lowermost layer is called stabilizing, because it increases rigidity and protects the board from damage, preventing it from deforming. Sometimes there is another soundproof layer under this layer, but laminate with such a substrate is produced only in a number of collections. 2. The middle layer is called the carrier layer - it is the main part of the structure. The heat-insulating and sound-proofing properties of the laminate, as well as its ability not to pass water, depend on its quality. Made bearing layer of HDF - dense fibreboard. A distinctive feature of this part of the board is that there is a lock on it for connecting with other boards. 3. Next, moving up above, we will see a decorative paper layer. His design determines what the floor will look like - wood, parquet, stone or ceramic tile. 4 . The topmost layer is called protective - it does not allow the laminate to quickly wear out and deteriorate from impacts. It consists of acrylic or melamine resin coating. The thicker it is, the higher the class of the laminate, showing its resistance to wear. Modern design manufacturers have made adjustments to this layer. Now it can be not only protective, but also decorative. For example, for maximum imitation of a tree, irregularities can be made. Now they practically do not stack laminate on glue, because locks are much more convenient. Using them, you can not only quickly assemble the floor, but also disassemble it without much difficulty. And such a need may sometimes arise - for example, you will need to change the floor when moving. In this case, the dismantling of the laminated coating will not cause problems, and all the boards will remain intact. Laminate is produced by a large number of manufacturers, and each of them has its own locking system. But you should not be afraid of this - after all, according to the principle of operation, they are all divided into only two groups: Click locks and Lock locks. And now we will tell you more about each of the two types. 1. Lock - a latch with a thorn and a groove. Lock type lock is called hammer. 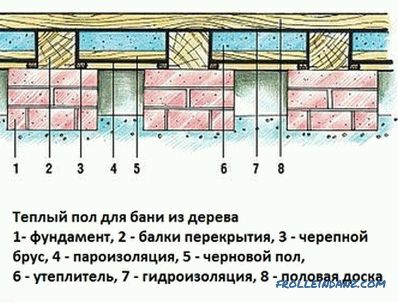 It is very simple in construction and economical. 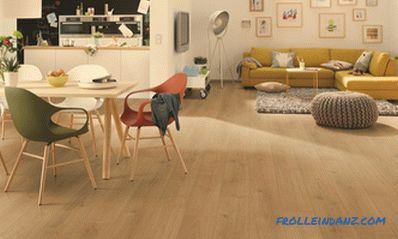 Such a connection has been used for a long time, so many consumers choose laminate with it. 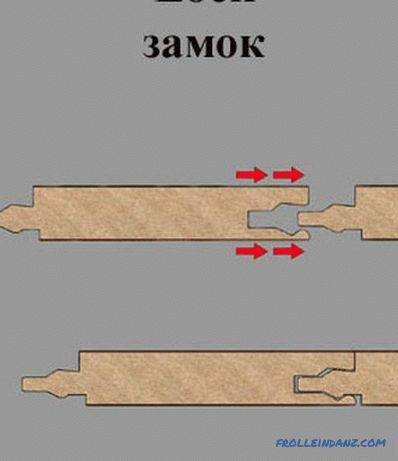 The principle of its operation is as follows: a spike is inserted into a groove on one laminated board, which protrudes on a neighboring board. For the strength of the connection, the spike is equipped with combs, which are held in the slot, firmly locking the lock. Clay is not needed, everything keeps up so well. 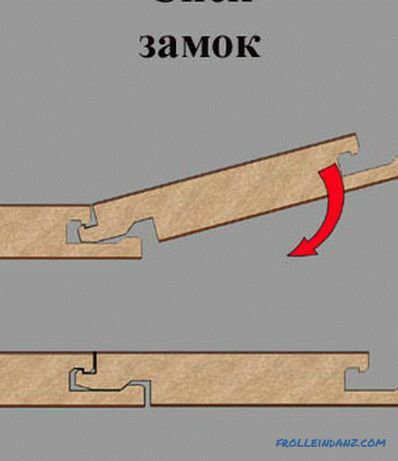 This castle is called a zabivny castle because when the laminate is laid, the boards are hammered into each other, tapping them with a wooden or rubber mallet. But it is better to let it do the master - professionally laid laminate will last longer. However, consumers usually do not complain about this connection - it is quite reliable and long-lived. Although drawbacks and latches are also not deprived. Most of all, he does not like a lock of the type of permanent loads on the floor. After all, at the same time, both the spike and the groove entering the joint rub against each other, gradually becoming faded and thinning. Inevitably there are cracks, after which the castle is no longer subject to recovery. But laminate manufacturers are trying to correct this deficiency - each uses its own method for this. 2. Lock Click - suitable for non-professionals.This lock connection is collapsible. It appeared later than the previous one, being considered more "advanced" and of higher quality. Particularly pleased with home craftsmen that even a person without experience can cope with such locks. Ease of assembly and disassembly allows you to get quick and excellent results. So - it is not necessary to call professionals for laying laminate. Having coped independently, at the same time and you can save. The click-type lock works as follows: when you dock two laminate boards at an angle of 45 degrees, you need to gently press the lock connection. It will snap without much effort. It is very convenient that you do not need to tap the lock with a mallet, nor use any other tools. Everything is done by hand, and it is easy and fast. And the drawbacks of the previous lock are eliminated here - when there is no friction load, it is not observed, since the joint experiences compression. Accordingly, it becomes even stronger. velocity and quantity of swelling when wet. What are laminate classes and the EPLF association? The same European standard EN 13329 is used for the classification of laminate flooring. Classes 21 to 23 are only suitable for use in an apartment or house. Now they have ceased to produce because of low strength. Class 31 is also intended for residential use. Class 32 can be used in those rooms of the apartment where there is an increased load (entrance hall, kitchen, corridor). This laminate is also suitable for office space with low traffic. Class 33 suitable for public, office, and industrial premises. Able to withstand heavy loads. Class 34 - especially durable coating (sports), has a high resistance to abrasion. The right to belong to a certain class is obtained only by those producers that are members of the EPLF association - European Producers of Laminate Flooring. In Russian, this abbreviation is written as: AEPLNP (Association of European manufacturers of laminated coatings). And if the manufacturer does not belong to this organization, the class indicated on the package often does not correspond to the technical characteristics of the laminate. After all, testing properly (in accordance with European standards) was not conducted. So sometimes it turns out that class 32 or even 33 is indicated, but in reality this coverage does not reach class 22. Not only many Chinese manufacturers, but also some Russian, are notorious for such dishonesty. If you go into a huge construction hypermarket, then you can certainly see laminate with a class of 33 and a thickness of 7 millimeters on its windows. It would seem - nothing special, but this fact speaks of a clear non-compliance with standards. According to European standards, this class of laminate should be at least a millimeter thicker, i.e. 8 mm. And to avoid such incidents and not be deceived even in trifles, check out the list of producers-members of the EPLF association. Detailed information is here: www. eplf. com / en / members / list / ordinary. html. This is the site of this organization. But it should be noted that the division of laminate into classes is a relative matter.For example, in Austria, Germany and Belgium, wear resistance is determined by the AU index, which demonstrates the strength of the protective layer of the laminate. Laminate classes themselves, demonstrate the density of HDF fibreboard and its resistance to stress. Therefore, on the label to the value of the class (from 31 to 34) certainly added value AC. If you see in the store a laminated flooring of class 32 with an AC5 value, you should understand that this material is intended for residential premises with a high load. Manufacturers from China are trying to wrap this ambiguity in their favor - they indicate only the class, and nothing more. But class 33 may have a different protective coating - from AC3 to AC5, and this is not the same as for durability. From the outside, it seems that laminate flooring with different AC characteristics is absolutely identical, but in fact it turns out that their service life is different. Next, we’ll talk about three main characteristics that you should pay attention to when choosing a laminate for your home. As already mentioned, laminate is currently produced in four main classes: 31, 32, 33 and 34. It is considered that class 31 is suitable for a bedroom, class 32 is for those rooms of an apartment where the floor load more, and classes 33 and 34 are used in commercial premises. However, this separation is still somewhat superficial - you need to look more deeply. For clarity, consider how exactly laminate is tested, checking it for wear. A sample of the laminated coating is fixed in a special device, and then it is subjected to a rotating abrasive disc. First measure the speed at which the coating will be scratched. After some time, the protective coating will be completely erased, and the number of revolutions measured again. Add up the two measured values, find the average value - this is the wear resistance, which is indicated in revolutions. We give specific examples. Assume that the abrasive can already scratch the protective coating after 200 revolutions, and for its complete destruction the grinding wheel will have to rotate longer - about 4000 revolutions. We get the average value equal to 2100 rpm. And another brand of laminate may have other values: scratches appear after 1200 revolutions, and full erasure - after 3000 revolutions. The average value is again the same - 2100 rpm. It turns out that both floor coverings are of the same class for durability. However, in the first case, the laminate is scratched faster - because it does not have a protective layer of corundum in the composition, which prevents scratches. And the increase in the thickness of melamine reduces wear. But adding corundum is quite expensive, and therefore you can find class 32 laminate, which costs more than class 33 material. And if, having flattered at a low price, the landlord chooses a budget option of class 33, then he may soon regret it. The floor will scratch too quickly, losing its presentation. But it will be a pity to remove the floor covering, because its top layer will not rub off for a long time. It happens that another 10 years, people use this floor - durable, but having a completely unpresentable appearance. You can also imagine another development - the purchase of class 32 laminate, more expensive, having corundum in it. Such a floor will not lose its appearance for a long time, but it must be remembered that it is inferior in terms of abradability to material of class 33. The apartment will have such a laminate "to court", having served from 15 to 20 years, and for a long time remaining attractive. But in a hotel or a shop where a lot of people go, it will quickly fail — it will wipe. Practice shows that in dwellings 32 and 33 classes of laminate exhibit approximately the same durability. Indeed, in all respects, except for wear resistance, they are very close. In particular, the HDF cooker has the same characteristics in both classes. And she, by the way, wears out faster than a durable protective coating (which in the apartment will begin to wear off no sooner than after 15 years). Note that the characteristics of the laminate by class, according to the standard EN 13329, include some more important parameters. This, in particular, heat resistance, moisture resistance, impact resistance, which we will discuss later. We only note that the standards of laminate produced in China and Russia do not have such severe restrictions. After all, these two countries are not members of the EPLF association. HDF board with a cut-out joint - the main element of the laminate board. It makes up a large proportion of the cost of the laminate.The denser the HDF board, the less the laminate gets wet, the longer the joints will hold and hold more tightly, preventing the appearance of gaps between the boards. It is also important that the slab is made so precisely, whether it has deviations from the geometry. 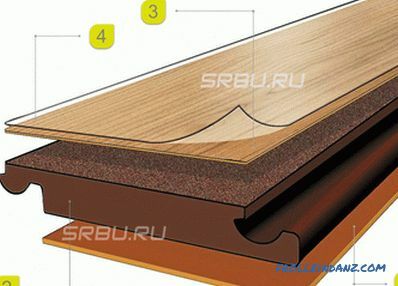 If all the dimensions are observed "in the thread", then laying the laminate will not be particularly difficult, and subsequently no cracks are formed. Naturally, you have to pay for excellent quality. Therefore, often in the building stores you can see several brands of laminate of the same class, but at different prices. Moreover, these prices may differ even by several times. Many people think that wax coating on locks is all that a laminate needs to protect it from moisture. But this is not so - in this case moisture-resistant material cannot be called. And although the wax impregnation brings the benefit, but you should not rely on it. It only pushes the moment when water gets inside the material. And if you take the usual (non-moisture resistant) laminate and leave it in a damp room, then waxing will keep it from water for only a few minutes. And sawing off pieces of the boards when laying, we leave them completely unprotected. The real reason for waxing the ends of the boards is to make laying laminate easier. In addition, you can mask some of the flaws of the locks. If the material is of poor quality, then without wax it usually squeaks after laying. But the impregnation is gradually wiped off, and then the cleverly hidden creak still appears. Water resistance to the laminated coating is given by a dense and high-quality HDF board, and not wax impregnation at all. For reliability, this slab is coated with a special composition having water-repellent properties. It would not be superfluous to recall that a good laminate that is not afraid of moisture can only be bought from the manufacturer that is part of the EPLF association. After all, the European standards and requirements for water resistance to HDF plates are very strict. 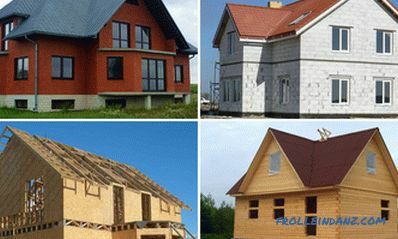 When various fiberboard and chipboard (MDF, HDF, particleboard, fiberboard), as well as plastic products are made, then binder used phenol-formaldehyde resin. As a result, products become cheaper, but also less safe for humans. Harmful to health gas - formaldehyde (chemical formula CH 2 = O) - is released from finished products. This substance is a sharply smelling gas that has no color. After research by the International Agency for Research on Cancer, it turned out that inhalation of formaldehyde in humans increases the risk of acquiring cancer. But this gas is used everywhere: from it make the resin added to paints, flooring, fabrics, plastic products. In addition, formaldehyde is used as a preservative and disinfectant. European manufacturers of laminated coatings should maintain strict control over the content of formaldehyde in their products. For this there is a norm EN 14041: 2004. 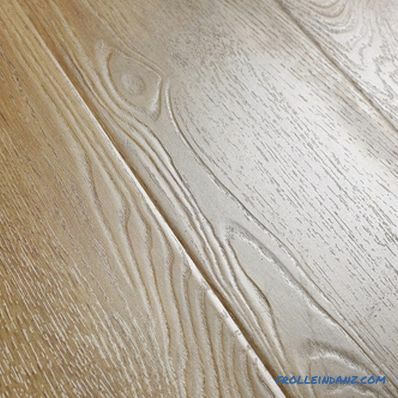 For example, you can compare high-quality laminate produced in Europe (designated class E1), and parquet. We will get approximately the same percentage of formaldehyde, which is also added to modern floorboard. 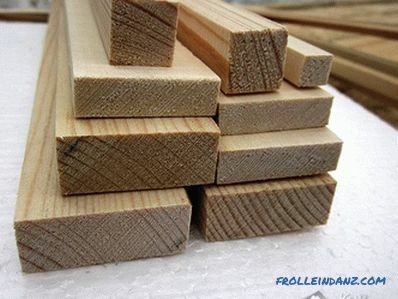 Much softer requirements for the content of formaldehyde in Chinese laminate. Studying the advertising booklet of any brand of European laminated coating, you can often see the alphanumeric designation in the title: "Е1". This is good - it means that this material emits formaldehyde in an amount not exceeding 0.12 milligrams per cubic meter. And this is verified by the relevant European standards. Remember: if after you opened the package with laminate, there was a strong unpleasant smell, carry the purchased goods back. It is dangerous to health! According to the norms let's say a slight smell of sawdust, no more. No paint "aromas", as well as smells of gouache, Christmas trees, glue is not allowed. And for a deeper check, you can take a laminated board and put it in water. In 20 minutes we smell it - if a sharp smell appeared, then this material is clearly unhealthy. However, European manufacturers, even well-known, today produce not only safe laminate. After all, if the goods are exported to the countries of the third world, then the content of formaldehyde can not worry so much. For this they do not fine, as in Europe, and even more so the licenses will not be deprived. 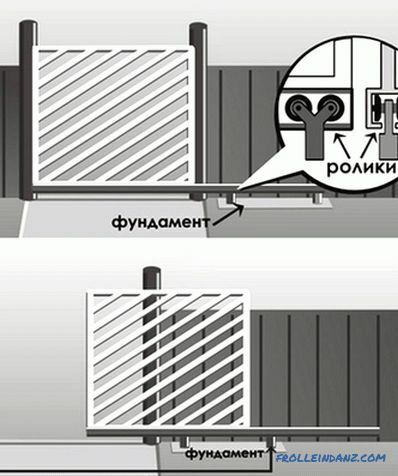 It is only necessary to write on a batch of laminated coating that it is intended only for sale in Russia. This is often done in joint ventures. So that nothing happens to the laminate when it comes into contact with a smoking cigarette, it must comply with the standard EN 438. The fourth degree according to this standard indicates that the surface of the laminated coating did not suffer or change at all. The behavior of the material when exposed to an open flame is determined by other standards: DIN 5510 and DIN 4102. After testing the laminate is usually assigned a category B1 - flame-resistant material. This laminate quality is tested according to EN 20105 - aka Blue Wool Standard. According to this norm, there is a scale of eight positions. As a rule, laminated coatings occupy position 6 in this scale. By cutting off the end edge of a laminated board at an angle, you get a facet. When laying such material where the boards are joined, small grooves are formed. Chamfering has two goals: decorative and utilitarian. Moreover, in size it can be quite a deep groove (with a width of 3 or 4 millimeters), and a tiny chamfer. Mostly cut the edge around the perimeter of the board, but sometimes chamfers are made only from the long sides of the tile. So you can get the "deck effect" - the feeling that the floor is made of very long boards. The appearance of the laminate with a chamfer. Often a laminate imitates a wooden surface, repeating its texture and design. And massive boards basically all have chamfers, which successfully mask the defects arising from the expansion and shrinkage of wood. Therefore, a laminated board with a chamfer, more successfully copies a wooden surface. A chamfer twice or three times extends the service life of the coating, at which it does not lose its appearance. 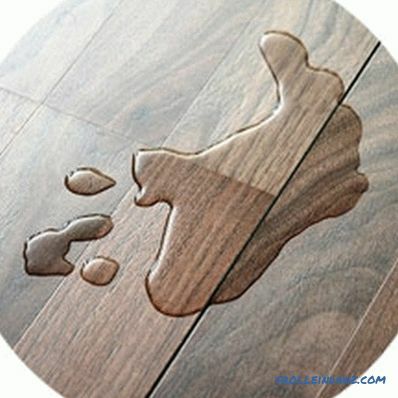 Despite the resistance to water, the laminate does not like very wet cleaning. And if the edges are not chamfered, the board joints can then bulge. Chamfers on the edges of the laminated boards allow you to avoid this trouble. There have even been cases when the floor completely flooded with water (during the flood from the neighbors) did not lose appearance. Naturally, it was a high-quality European laminate with a chamfer, which is based on a dense HDF slab. Using laminate with chamfers reduces the cost of leveling the base of the floor. Installation instructions for the laminated coating states that the surface must be flat before installation. The height difference for every 2 m should be no more than 2 mm. You have to spend a lot of time and money. Thanks to the laminate with the chamfer and the substrate for leveling this procedure can be simplified. An ordinary laminate gradually takes the form of a floor, forming micro cracks between the tiles. Material with a facet of this defect is deprived. Do not level the floor can with a height difference of 4 mm. Opponents of chamfers believe that they accumulate dust and dirt, which is difficult to remove. It is not true that the millimeter groove is easily cleaned during cleaning. Without a substrate, this coating is usually not used - it is too loud. Choosing a soundproofing material, it is best to stay on the substrate of the cork, sold in rolls. The thickness of the board is 8 mm. The locking connection has a click type (it is collapsible, does not require the use of glue). The warranty period for use in an apartment is from 10 to 12 years. It is used in living rooms, bedrooms, children - wherever the permeability is not very high. 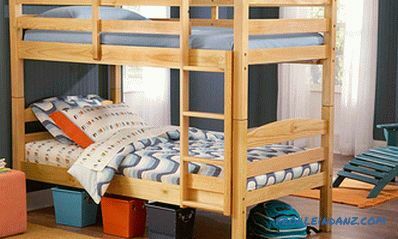 Ideal for a child's room, if you plan to later replace the floor. As a rule, the surface has a slightly glossy, blurred wood pattern, the board has no relief. The board has a thickness of from 7 to 12 mm. Click type lock. Warranty period: for apartments - 15 years, for public spaces - up to 5 years (depending on the intensity of use). It is recommended for any living room, including the hallway and kitchen. Concerning commercial premises: it is better to use where the permeability is average. This may be a hall, office, shop, administrative building. In appearance, it can imitate the tones of natural wood, and can also be made in bright colors to create modern interiors. As a rule, has the relief covering interfering sliding. There are stamps that very skillfully repeat the texture of the tree or its cut. The board has a thickness of 8 to 12 mm. Lack of loudness (thanks to a thick board), additional protection from noise and heat preservation, high frost resistance.Glueless click lock, which has a moisture-resistant impregnation and reinforced construction. The apartment can be used for 20 years, in commercial premises - at least 12 years. It can be used in any premises of both residential and commercial type. Thanks to the waterproof impregnation of the whole plate, it is possible to use it where it is very humid. For example, in the rest room in the bath. Colors can repeat the structure of the tree, as well as be bright and avant-garde. The surface is anti-slip, embossed, completely imitates wood surface or tile joints (if the laminate is decorated under a stone). Note that in European norms 13329: 2006 + A1: 2008 (E) this class of laminate is not reflected. This material is produced by pressing at high pressure, which allows to obtain HDF tiles with a density of 950 kg per cubic meter. This slab is impregnated with a special composition and coated with several layers, each of which has its own function. In order to prevent the plate from deforming, it is glued to it with strong Kaffer paper with a moisture-resistant finish. There is also a noise absorbing substrate. And the top decorative layer imitates the texture of wood. The melamine resin that makes up the protective coating provides mechanical strength. Since this coating is multi-layered, the laminate is not scratched, does not fade and is not afraid of household chemicals. Patency of such a floor is more than 1000 people per day. Therefore, it can be used in restaurants, entertainment and sports complexes, public buildings. There he will serve from 7 to 15 years, and in the apartment - 30 years.